Christmas is coming (again!) and every year I love to share my favourite picks from my favourite online stories and this year's is no exception. 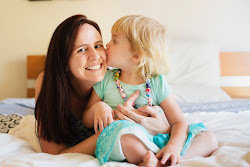 I've rounded up my top ten toys from babies up to preschoolers all from The Creative Toy Shop! Trust me - you are going to love this collection. This post contains affiliate links. I was kindly gifted the Grimm's butterfly pictured towards the end of the post in exchange for this feature. 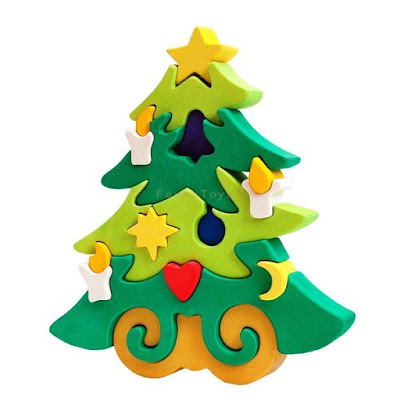 Technically this Wooden Christmas tree puzzle would have to be an early present for your child to engage with in the lead up to Christmas, or it would be perfect for the classroom as you begin to decorate and celebrate Christmas. Great for fine motor skills, problem solving, balancing and creating and it's just so pretty. Can I have one please? Babies can be hard to buy for - they can't give you any ideas or a wish list like older kids can! So we just have to guess and choose gifts ourselves. Babies usually love things that make noise when they shake them, toys with various textures to touch, feel and explore, and things that are safe for them to put in their mouths. If it's your baby's first Christmas - check out these three ideas! This sensory puzzle by Le Toy Van is just as I described. Chunky puzzle pieces of each different shape and colour and each piece holds a special surprise. Look through a kaleidoscope, shake to hear bells jingling, touch the textures, peer through, squeeze and fold. A delight for the senses! 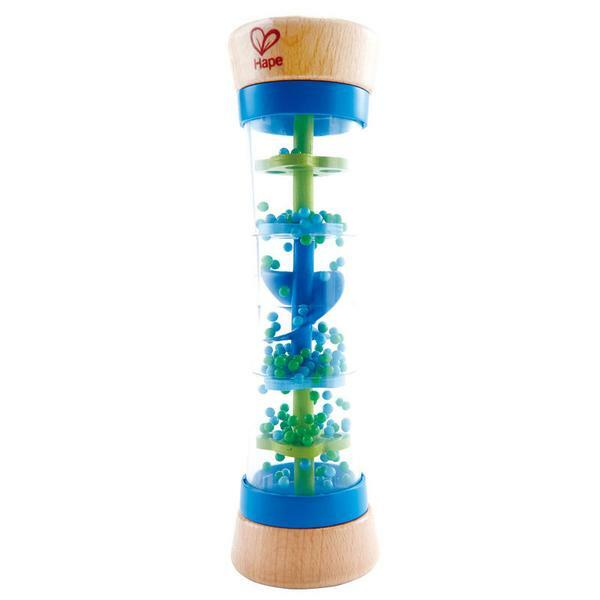 To get your baby his or her very first Grimm's toy - this colourful bead grasper is perfect! The beads are all attached together securely, yet still move, swivel and knock together making a really great sound. The rainbow colours make it so eye catching for babies! 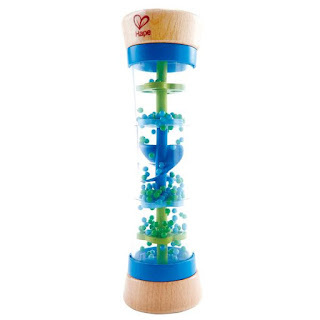 A truly gorgeous baby toy is this Hape rainstick which makes the most lovely sound as the balls trickle down the levels. Babies can shake, tip and turn it over and learn that very early skill of cause and affect (if I do this - something will happen!). Little Man is all about trains at the moment ("toot toot" he says every time we go over the train tracks near home), and out of all the train sets I've seen my favourite is the Hape Rail collection. 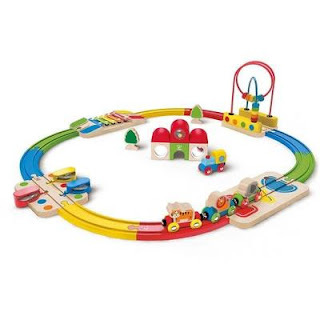 They are so cleverly designed to make the train track play experience so much more! Music is made as the train tinkles over a xylophone, there are puzzle pieces, tunnels and mirrors and puzzle pieces needed to problem solve. A photo really doesn't do it justice - check out the video to see it in action. 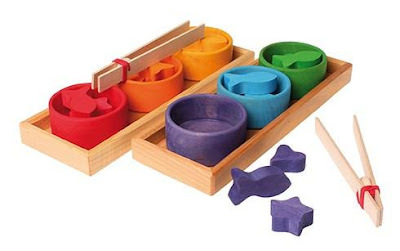 New to The Creative Toy Shop is this Grimm's rainbow sorting game, another one which I know Little Man would love. He's really interested in using tongs ("nip nip" he calls them), and they're so great for fine motor skills. 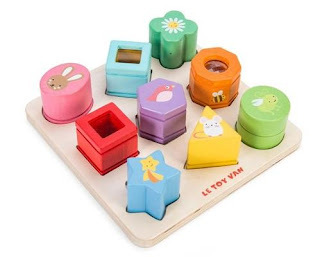 Toddlers have the ability to begin very simple sorting tasks - just like in this game. Pick up the fish with the tongs and place them in the right bowls. And as you know with Grimm's products - they certainly have more than one use! 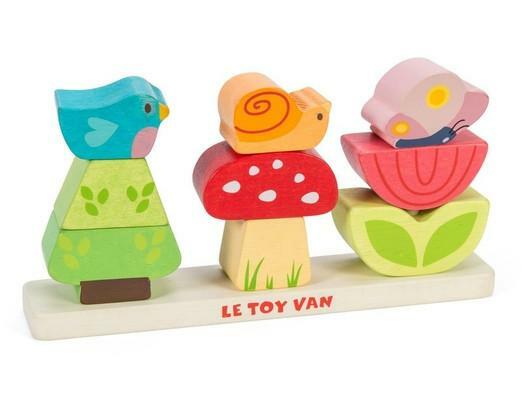 Another goodie by Le Toy Van is this stacking garden. Great for hand eye coordination and dexterity as they place each of the nine pieces onto the sticks to create their own garden combination. Such a pretty toy this one! I posted this photo of these new Rainbow Pebbles on Instagram and it kind of went nuts! It was my most liked photo EVER so you guys must really love them. As I explained on Insta, they are like a smoothy rubbery texture - unlike regular pebbles/stones. But still very sturdy. They can be sorted by size or colour and balanced on top of each other. 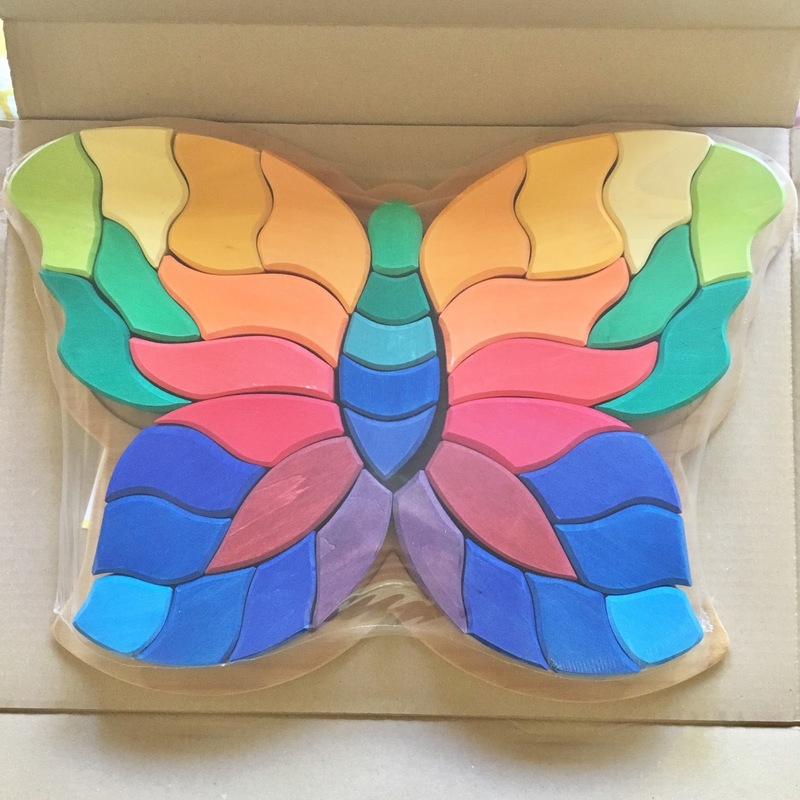 Such a fantastic new product from The Creative Toy Shop! The Wobbel Board is the newest multipurpose toy sweeping the Internet and The Creative Toy Shop is one of the few stockists in Australia. 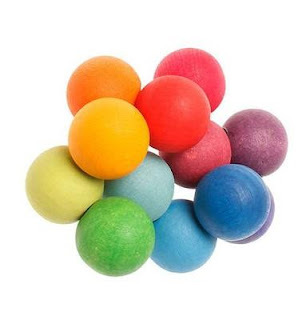 They can be a great addition to small world set ups, ramps for cars, a makeshift tunnel or bridge, but above all it's great for whole body movement! 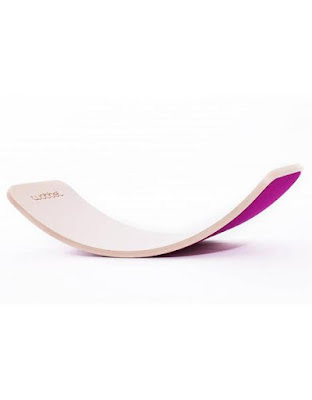 Children can balance and rock, swing and and play with their own Wobbel Board. We got our Dear Little Designs letter box a while ago, but a friend actually said to me recently that she's getting one of these for her daughter (who is the same age as Miss M) this Christmas. So I thought it would be a great gift idea to finish off my list. Encourage early writing and imaginary play with their very own letter box complete with letter writing templates, materials and stickers. Wow what an amazing collection of goodies! Please do look at the full range that Brianna from The Creative Toy Shop has to offer - it really is the best place to buy Grimm's that I've seen. She has the best range. Also thank you in advance to any followers to purchase via my affiliate links in this post - this means that we earn a small commission from your purchase (not costing you any extra of course). I am so excited for this year's Christmas!